Wander Beauty captures the entire essence of summer in this two-in-one, skincare-enriched hydrating radiance liquid illuminator and highlighter stick that delivers a beautiful champagne pearl finish in one unique dual ended tube. Yeah, that was a mouthful but trust me…you and your skin will thank us for introducing you to this miracle in a tube once you see the resulting glow. 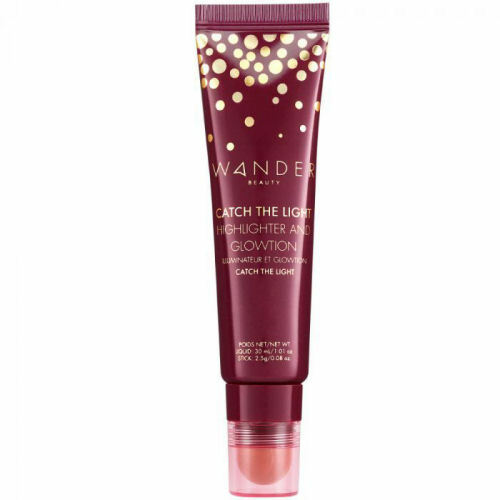 Wander Beauty Catch The Light Highlighter & Glowtion adds that soft focus glow while the stick highlighter allows you to create a beautiful strobe. You don’t want to look radioactive, so the differing textures allow you to tone things down with dimension. Microfine pearl pigments reflect light and you’ll be left with that much-desired healthy sheen. Wear under makeup for a little additionally dewiness. Or you can rock it a la carte for the same effect. Use it to highlight or mix it with foundation or highlighter for extra illumination. You will use this baby over and over until there is nothing left on either side. Beauty Insider – Nail Art: Why Not?